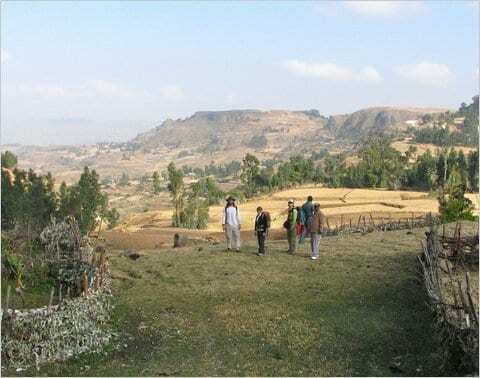 SMU paleobotanist Bonnie F. Jacobs is sharing her scientific field work in Ethiopia with the public as it happens in real time through posts filed to the New York Times' "Scientist at work" blog. Jacobs, one of a handful of the world's experts on the fossil plants of ancient Africa, is part of a team of paleontologists hunting plant and animal fossils in Ethiopia's prolific Mush Valley. Jacobs is an associate professor in SMU's Roy M. Huffington Department of Earth Sciences. Central Africa 65 million years ago was a low-elevation tropical belt, but still unknown is whether its mammals browsed and hunted under a lush rainforest canopy. More research needs to be done, says SMU paleobotanist Bonnie F. Jacobs. A new review of the literature shows fossil pollen provide no definitive evidence for communities of rainforest trees at the beginning of the Cenozoic, says Jacobs. National Geographic News interviewed SMU postdoctoral researcher Timothy S. Myers about the new species and genus of pterosaur he identified and named Aetodactylus Halli. 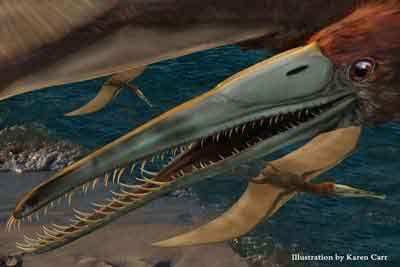 Pterosaurs are a group of flying reptiles commonly referred to as pterodactyls. In the April 28 article "Toothy Texas Pterosaur Found; Soared Over Dallas" reporter John Roach talked to Myers about the 95 million-year-old jaw that was discovered by Lake Worth resident Lance Hall. A fossilized jaw discovered at a construction site in Mansfield has been identified and named Aetodactylus halli by SMU paleontologist Timothy S. Myers. Rare in North America, the winged reptile was soaring 95 million years ago over what would one day become Dallas-Fort Worth. For paleobotanist Bonnie Jacobs standing atop a mountain in the highlands of northwest Ethiopia, it's as if she can see forever — or at least as far back as 30 million years ago. Jacobs is part of an international team of researchers hunting scientific clues to Africa's prehistoric ecosystems. The researchers are among the first to combine independent lines of evidence from various fossil and geochemical sources to reconstruct the prehistoric climate, landscape and ecosystems of Ethiopia in particular, and tropical Africa in general for the time interval from 65 million years ago — when dinosaurs went extinct, to about 8 million years ago — when apes split from humans. 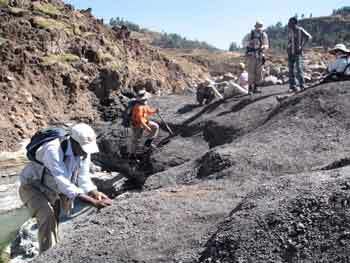 A team of researchers led by paleobotanist Bonnie Jacobs and sedimentologist Neil Tabor of Southern Methodist University returned to northwestern Ethiopia in late December 2007 to spend almost a month collecting additional plant fossils and gaining a more thorough understanding of their geological context. In December 2006, the team collected more than 600 plant fossils, which are on loan for study in labs at SMU's Roy M. Huffington Department of Earth Sciences in Dedman College. All told, the team has documented more than 1,500 plant fossils, hundreds of vertebrate fossils and numerous examples of ancient soils. This year they widen their search to better understand the geology, landscape, plant and animal communities, and climate of Chilga, Ethiopia, 28 million years ago.